Burt Lake is located in Cheboygan Count in Michigan and named after William Austin Burt who made a federal survey from the years 1840 to 1843. The surface of the lake reached up to 17, 120 acre or 69 km2. The lake stretches 10 miles or 16 km from north to south, about 5 miles or 8 km at its widest and 73 feet or 22m at its deepest. The lake serves home to Lake Sturgeon, which temporarily held as the largest sturgeon caught in the United States. Burt Lake is part of the Inland Waterway. One can ride a boat from Crooked Lake near Petoskey across the northern part of the Lower Peninsula to Cheboygan on Lake Huron. One can find several resorts and camping side along Burt Lake’s location. If you want to just buy our Burt And Mullet Lakes Wood Map here, you can or keep reading for some great info on these fishing havens. What are activities in Burt Lake? What are the fishes caught in Burt Lake? Fishing hot spots in Burt Lake are located in Dagwell Point, Colonial Point and Greenman Point. Also, the southern shore of the lake provides, a shelter for fish around the weed lines. The Mullet Lake is located in Cheboygan County in Michigan and named after John Mullet. Mullet along with William Burt made a federal survey of the area between the years 1840 to 1843. Mullet Lake and its neighboring lake, Burt Lake shares its major inflows from the Indian River. This river also connects the two lakes as well as Pigeon River, Little Pigeon River, and Mullet Creek. The water current of Cheboygan River flows out in the northeastern part of Mullet Lake. 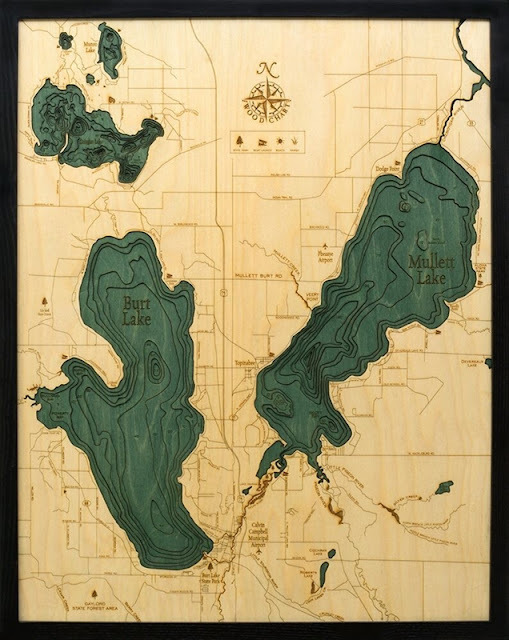 The lake belongs to the Inland Waterway, and once can cross the lake from Crooked Lake about 38 miles or 61 km close to Little Traverse Bay on Lake Michigan. Mullet Lake stretches 10 mi or 16 km long, its widest span is about 4 mi or 6.4 km. The whole surface area of the lake spreads about 16,630 acres or 67.4 km2. Mullet Lake measures 148 ft or 25 m at its deepest. What are activities in Mullet Lake? What Kind of Fish Are Caught in Mullet Lake?